Allergan launches REFRESH® REPAIR ─ the first and only artificial tear in the U.S. with CMC, HA (inactive ingredient), and Osmoprotectants. 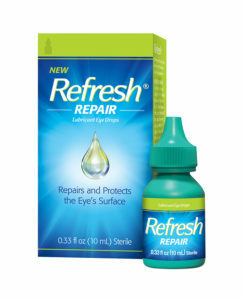 REFRESH® REPAIR helps promote healing of the cornea and conjunctival epithelia and improves visual performance in Dry Eye patients. This unique formula also contains Osmoprotection, which safeguards epithelial cells against hyperosmotic stress by displacing salts with restorative, organic osmolytes. It is clinically proven to treat the signs and symptoms of Dry Eye and is safe to use with contacts. refreshbrand.com/doc.